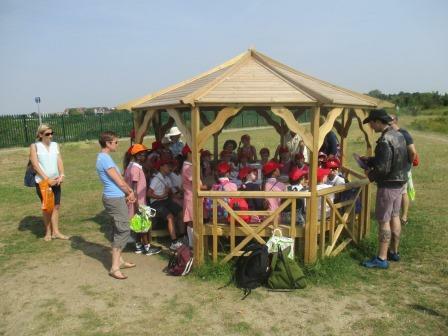 On 21st June Year 3 visited the Poppies Wave in Gunner's park as part of their topic on local history. The children were filmed by Beth Hooper, from Blade Education, whilst having their guided talk about WW1 and the local history of The Garrison. Everyone found the information so interesting that Mrs Gillett decided to set a research project for homework, asking the children to talk to their relatives about their involvement in WW1. The homework was amazing and we had a range of journals from POW’s, letters from soldiers to their loved ones, photos of nurses and a selection of medals. Beth came in today to film the children talking about their homework projects and their visit to the Poppy Wave. She has asked to scan some of the children’s work as she felt they were so impressive and they are going to be included in the following website along with the short film of the children. 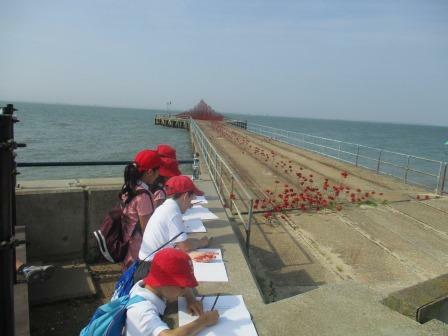 We have also been asked to help to create a huge Poppy ‘water- fountain’ in the Rose Gardens on the seafront. There are twelve other schools that have signed up to the project so far and the aim is to all go down to the sculpture that the children have helped to make and have a memorial service followed by hot chocolate during the week of Remembrance Day!